HAPPY ANNIVERSARY TO US! 6O EPISODES! CAN YOU BELIEVE IT? ALSO, CLARE’S NEW BOOK RISE & RESIST, HOW TO CHANGE THE WORLD IS OUT NOW. In 2018, the Centre for Sustainable Fashion at London College of Fashion turns 10. You're going to meet its founder, academic, designer, educator and all-round sustainable fashion legend Dilys Williams. This is a lively and thought-provoking discussion about how we might totally redesign the way the current fashion system works. We talk about the role of the designer, the role of fashion in all our lives and how commerce fits in. We discuss the importance of being critical thinkers, fashion rebels and outspoken advocates for justice. We touch on DIY, Margaret Thatcher, The Clash, and finding your fashion identity, but also big stuff continuing the conversation that’s been running through this series of the podcast about how we stand with nature, and what our obligations are to it. How do we define our struggle for sustainability? Professor Dilys Williams is Director of Centre for Sustainable Fashion, a University of the Arts Research Centre based at London College of Fashion. A former womenswear designer for Katharine Hamnett, Liberty and Whistles, she’s also an author, a member of the Observer Ethical Awards judging panel, and co-secretariat to the House of Lords All Party Parliamentary Group on Fashion, Sustainability and Ethics - for more on this, check out Episode 53 with Baroness Lola Young. Pic via ReMake Our World. When we recorded this interview, Dilys was wearing a white cotton poplin skirt and a navy jumper, something of a uniform for her - classic white, basic navy, maybe a bit of a fisherman’s jumper with jeans. JOHN SMEDLEY is a British knitwear company. Their factory has been at Lea Mills, Derbyshire for 230 years. Classic, reassuringly expensive but also cool - the Beatles wore John Smedley. Paul Smith, Vivienne Westwood and Katherine Hamnett produced knitwear with John Smedley. Clare’s mum sold the brand in her boutique. Read about their approach to sustainability here and here. KATHERINE HAMNETT is the bee’s knees. She’s also trying to save the world’s bee’s. Katherine Hamnett is Wardrobe Crisis’s hero. Remember her early slogan tees? From CHOOSE LIFE to STOP ACID RAIN, get the skinny, here. Want to learn more about Hamnett and her battle for organic cotton? There’s a whole chapter of Wardrobe Crisis, How we went from Sunday Best to Fast Fashion, dedicated to this, featuring an in-depth interview with her. Buy the ebook here. BUYCOTTING. The opposite of a boycott: deliberately purchasing a company's or a country's products in support of their policies, or to counter a boycott. 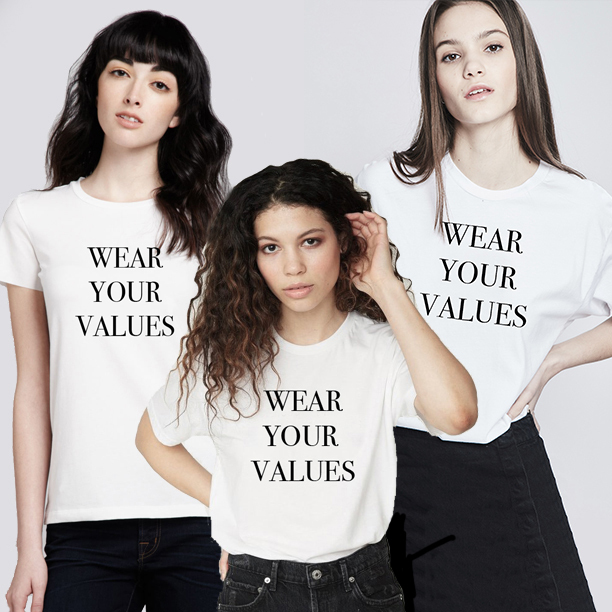 LABOUR BEHIND THE LABEL’s campaign, Fashioning an Ethical Industry, was designed to encourage students to think about fashion supply chain issues. It was funded by the EU, and ran from 2008 to 2010. Read about it here. Lucy Siegle is the British journalist who pioneered writing about sustainability for the Guardian in the 2000s. She is the author of To Die For, Is Fashion Wearing Out the World. Her new book is about plastic pollution. Professor Frances Korner is the Head of College and Pro-Vice Chancellor of UAL. CHRISTOPHER RAEBURN is one of our favourite sustainable fashion designers. He makes this fab jacket (below). He makes our day. Listen to him on Episode 29, here. The NIKE “MAKING” APP is an open-source tool that ranks materials used in apparel, based on four environmental impact areas: water, chemistry, energy and waste. The idea? To help designers and product creators make informed decisions about the environmental impacts of the materials they choose. More info here. BURNOUT. Clare mentions Gods & Monsters, Dana Thomas’s brilliant book about Alexander McQueen and John Galliano. 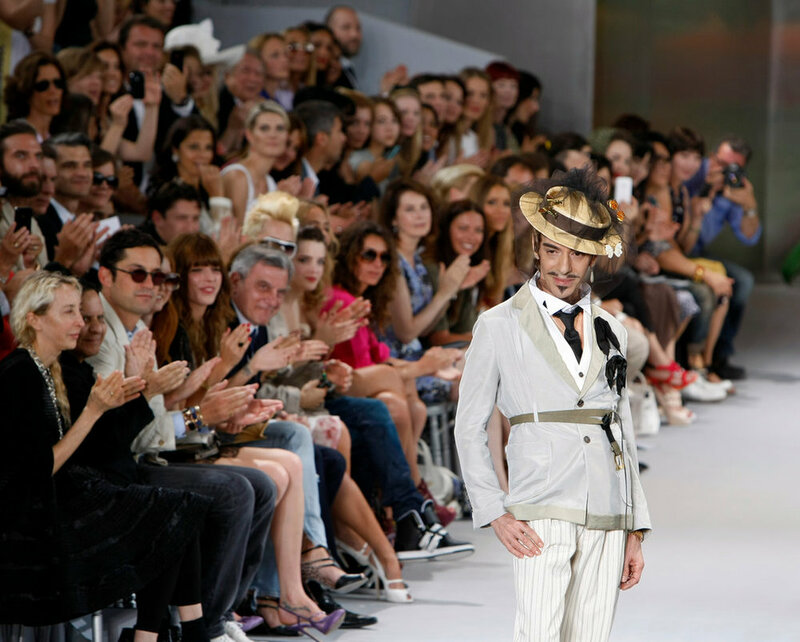 In it, Thomas reveals that at his height Galliano was designing 32 collections for his own label and for Dior. Too much. Dilys says the pressure of pace remains a huge problem for the industry. As she points out, we need space to create and come up with ideas. “I do believe in the ingenuity of human nature, where at some point, however much technology allows us to keep speeding up, we will choose not to. We will choose to switch off and slow down.” We need, she says, to look at more carefully at wellbeing in fashion. PINNING OUR HOPES ON A FUTURE ON ANOTHER PLANET. Infinite growth on a finite planet is not simply not possible, despite the lies we’re fed to the contrary. In 2013, speaking to the Royal Geographical Society, David Attenborough noted that one of the biggest threats to the natural world was overpopulation, and improving women's rights around the world was the only effective way to bring birth rates down. "I have little doubt that if we have the capacity to limit our birth rate, then we should consider doing that," he said. "We have a finite environment – the planet. Anyone who thinks that you can have infinite growth in a finite environment is either a madman or an economist.” Via the Guardian. The STOCKHOLM RESILIENCE CENTRE is internationally recognised for its trans-disciplinary research. It advances the understanding of complex social-ecological systems and generates new insights and development to improve ecosystem management practices and long-term sustainability. Find out more, here. Just a gratuitous picture of Roxy Music’s Bryan Ferry. Just because. Dilys was an advisor for the V&A’s fantastic Fashioned From Nature exhibition at the V&A. (Missed it? Listen to Episode 44 about the exhibition, with head curator Edwina Ehrman here .) As part of the show, Dilys curated the interactive installations ‘Fashion Now’ and ‘Fashion Futures 2030’ - bringing in students to create elements, art pieces and pathways through the visual journey. Design academic NIGEL CROSS talks about design being an innate capability of being human. Whether you professionalise that or not, says Dilys, is up to you. THE CLASH were an iconic British new wave punk band. But you knew that already, didn’t you? 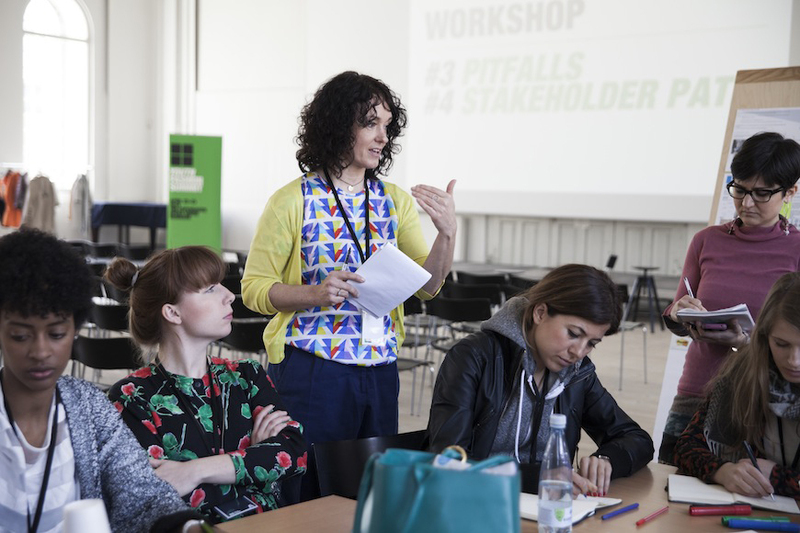 The YOUTH FASHION SUMMIT ties in with the Copenhagen Fashion Summit proper, in partnership with the United Nations Global Compact. The idea is to challenge fashion students, admitted from all over the world, to create a framework for the industry on how to reach two of the Sustainable Development Goals. In 2018, three students from RMIT in Melbourne took part: Amanda Morglund, a final year Bachelor of Fashion student, whose honours research project focused on the intersection of mycology and fashion design. Yep, mushrooms. Remember her name. Julia English, a final year student from Bachelor of Fashion, focused on examining the way we engage with and value our clothes. Lisa Kjerulf, a final year Masters student, is now working for the Australian Fashion Council. Hey Lisa.